Today my blog received Arte Y Pico Award from Marika of Marika's Artisan Handcrafted Silver Jewelry. Thank you Marika. I am so honoured by this award. Next, I need to pick 5 blogs to pass this award to. If I have the choice, there are more than five blogs that I would like to pass this award to but the rules says only pick 5, so here goes. 1. You have to pick 5 blogs that you consider deserve this award for creativity, design, interesting material, and also contributes to the blogging community, no matter of language. 3. Each award-winning has to show the award and put the name and link to the blog that has given her or him the award itself. 4. 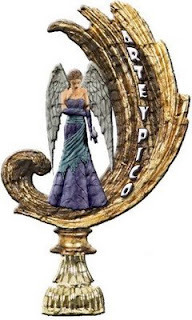 Award-winning and the one who has given the prize have to show the link of "Arte y pico" blog, so everyone will know the origin of this award. Thanks for the award! That was rather sweet of you. Hello Mei! How kind of you to award me! I've been away on vacation but am back now and will get this posted to my blog asap.